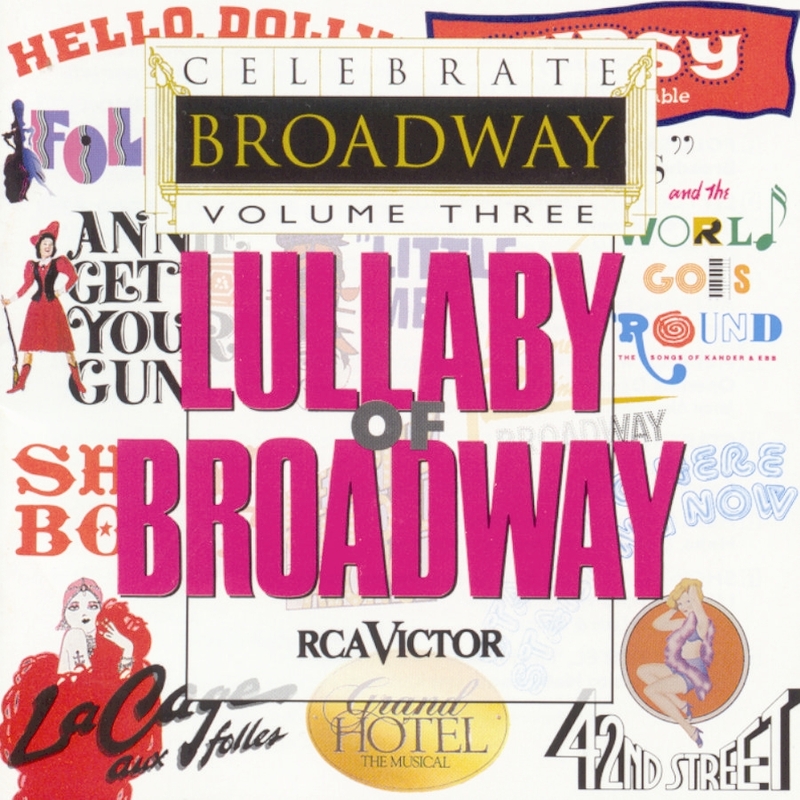 “Come on along and listen to the Lullaby of Broadway!” is the theme of this third volume of Celebrate Broadway. All these songs are either about Broadway or some aspect of show business that is like no other. Even the movies get a short tribute in this compilation. The songs themselves share that eternal and perhaps naïve optimism that people in the business must have in order to survive. David Merrick’s long-running song-and-dance extravaganza, 42nd Street, was a spectacular hymn to “the two most glorious words in the English language – Musical Comedy!” That line, when delivered by Jerry Orbach in “Lullaby of Broadway” on opening night, brought a thunderous ovation from the star-studded audience, not because of its silliness, but because most of the people in the audience believed it with all their heart. The show-stopping Stephen Sondheim song “Broadway Baby” has served performers of all ages (Ethel Shutta, Julia McKenzie, Daisy Eagan) in a variety of interpretations but none was as all-out knock-‘em-dead thrilling as Elaine Stritch’s deadpan rendition in the historic Follies in Concert at Avery Fisher Hall in 1985. The zesty Cy Coleman-Carolyn Leigh score for Little Me (with a hilarious book by Neil Simon) was a vehicle for Sid Caesar, but this song, with its old-time vaudevillian razzmatazz, is a delightful showcase for veteran performers Joey Kaye and Mort Marshall. Very rarely in the history of musicals has there been a show as perfectly integrated as Gypsy. The artists involved (Arthur Laurents, Jule Styne, Stephen Sondheim, Jerome Robbins) created a show that is always at work on many different levels. They’ve nearly outdone themselves with “All I Need is the Girl.” Here is a musical number that works on every possible level: it moves the plot along, it’s about more than just what is happening on stage (subtext!) and, not incidentally, it’s a swell tune. This version sung by Andrew Norman is from the London cast recording, which starred Angela Lansbury as Rose and featured Zan Charisse as Louise. Merrily We Roll Along perfectly captures what it’s like to be young, creative, starving, and optimistic in New York City. From the odd jobs, false hopes, and dead ends to the first breaks that show business has to offer, this number is what thousands of people feel every year when they arrive in New York from all over the world. Starting Here, Starting Now, the delightful and intimate revue of the songs of Richard Maltby, Jr. and David Shire, consisted of compositions from various projects, shows, club acts, etc., that Messrs. Maltby and Shire were involved with in the early part of their careers. “One Step” proves that you don’t need a cast of thousands and a big orchestra to have a showstopper. “Hello, Dolly!” proves that if you have a cast of thousands and a big orchestra and a great lady singing a terrific song, you can make theatrical history. For many, Rodgers & Hammerstein’s Oklahoma! is the first musical to fuse everything – book, song, and dance – together into one cohesive unit. For others it was Rodgers & Hart’s Pal Joey. But the fact of the matter is that it really was the granddaddy of them all – Jerome Kern and Oscar Hammerstein II’s Show Boat that did all of these things first. It is only in recent years that Show Boat, a legendary musical since Florenz Ziegfeld first produced it in 1927, has become recognized as the theatrical landmark that it truly is. This recording of “Life upon the Wicked Stage” features the lovely Allyn Ann McLerie from the 1965 New York State Theater revival which starred Barbara Cook, Stephen Douglass, Constance Towers, and William Warfield. Grand Hotel, the Musical, began life as At the Grand in 1958 in San Francisco. It closed out of town and in 1989 was resurrected by its original creators and Tommy Tune. During the show’s pre-Broadway engagement, composer-lyricist Maury Yeston was brought in to create a few new songs for the show. “I Want To Go to Hollywood” is one of them, sung by the absolutely bewitching Jane Krakowski. Speaking of changes during pre-Broadway tryouts, Silk Stockings had more than its share: its bookwriters, costume designers, choreographer, and at least five actors all left the show for a variety of reasons. One of the few people consistently involved with the show (other than the producers Feuer and Martin) was Cole Porter, whose last Broadway score this is. In “Stereophonic Sound” Gretchen Wyler sings of a sad reality about Hollywood. Jerome Robbins’ Broadway was an evening of the most exhilarating musical sequences directed and/or choreographed by Robbins. When A Funny Thing Happened on the Way to the Forum was having its troubled pre-Broadway tryout in Washington, DC, Robbins was brought in to stage a new opening number, “Comedy Tonight,” and it turned the show into a hit. Here, performed in Jerome Robbins’ Broadway by Tony Award® winner Jason Alexander, is the number that changed the fortunes of Stephen Sondheim’s debut as both composer and lyricist. La Cage aux Folles is a true old-fashioned musical comedy in the best sense of the word. When it was first produced in 1983, La Cage had a simple family story, a beautiful Jerry Herman score, star performances from George Hearn and Gene Barry, terrific choreography by the late Scott Salmon, and dazzling sets, costumes, and lights. It had something for just about everyone, which is why it won six Tony Awards® and ran for 1,761 performances. And the World Goes Round, a revue of the songs of John Kander and Fred Ebb, was created by Scott Ellis, Susan Stroman, and David Thompson, and opened off-Broadway to great acclaim in 1991. This offbeat version of the title song from Cabaret came about because the creators knew they had to include someone singing “Cabaret,” but wanted to find a way to have the audience hear the beauty of the song again. They succeeded. Can any of us imagine a time when “There’s No Business Like Show Business” didn’t exist? What was life like before it? What did people say when talking about show business before Annie Get Your Gun was first produced in 1946? Irving Berlin’s score is one of the greatest ever written for a musical – “I’ve Got the Sun in the Morning,” “Anything You Can Do,” “They Say That Falling in Love Is Wonderful,” and so many more. This recording was made in 1965 when Ethel Merman reprised her starring role in the New York State Theater revival, which later moved to Broadway. We’ve come full circle on this album because the man that starts singing “There’s No Business” to Annie Oakley is none other than Jerry Orbach – who about 56 minutes ago was telling us to come along and listen to “The Lullaby of Broadway.” There really is no business like show business.